Numerous sleep hygiene lists and sleep optimization "tips and tricks" inform us assertively that we should not nap. Taken out of context, this is not only partially inaccurate advice, it is downright empirically false. Fatigue risk mitigation strategies for night-shift and rotating-shift workers depend on naps in a crucial manner, and the safety data is there to back up the strategy. Amongst others, the Centers for Disease Control (CDC), National Safety Council (NSC), National Transportation Safety Board (NTSB), Occupational Safety and Health Administration (OSHA), American College of Occupational and Environmental Medicine (ACOEM) and American Academy of Sleep Medicine (AASM), have all emphasized the importance of appropriately timed naps for night-shift work, rotating-shift work and extended shift work. In addition, students and athletes can utilize naps as a powerful tool in the right circumstances. These subjects are discussed below. For now, however, we should recognize that naps can indeed be problematic, particularly for individuals that do not adhere to a consistent bedtime or have a "wobble" in the day to day timing of their circadian rhythm because of inconsistent patterns or a tendency toward a delayed rhythm relative to their desired schedule. Naps can also sometimes be problematic for the elderly. These topics are discussed in the circadian rhythm section. Sleep hygiene tips attempt to address these "common" concerns for the average sleeper, but not only are there select cases to address (for instance, the Down's Syndrome special case below), but a significant sector of the population can utilize appropriately timed naps when you consider that over 20% of the workforce engages in some kind of shift work, alternative shift, or an inconsistent schedule at any given time. It seems at first paradoxical that a recent study has disclosed that naps after learning are detrimental to a specific cohort. Persons with Down’s Syndrome appear to perform worse after learning when learning is followed by a nap versus no nap. The normal relationship is that napping (or sleeping) after learning increases the likelihood of retaining facts relative to not napping or sleeping following learning. But the apparent paradox makes sense if we understand the emerging story that a “one-two punch” is required from sleep to ‘consolidate’ learning. That tandem (to use a different metaphor) is the orchestrated dance between alternating NREM (non-REM) and REM sleep periods during healthy sleep. It is well-established, however, that REM sleep is compromised in Down’s individuals. The evidence is clear on one very good time to nap; particularly for night-shift workers, rotating-shift workers and workers about to embark upon a planned or likely extended-shift (including situation responders). That optimal time is just prior to work. Studies conducted with airline pilots have confirmed that pre-duty naps offer protection against critical reductions in vigilance and micro-sleep intrusions, and that circadian lulls offer additional or “back-up” opportunities during extended flights. NASA had already demonstrated the efficacy of 25-minute “power naps”. (In reality, naps were called “prophylactic naps” by the researchers in the airline pilots' study, but for implementation, pilot associations thought a better terminology was “power nap”). For day workers, a reduction in vigilance occurs immediately after awakening in the morning. These reductions can last a couple of hours for sleep-deprived individuals. Circadian lulls occur again in early to midafternoon. The timing for night workers is roughly 12 hours shifted, which positions the “afternoon lull” while there is ALSO a circadian dip in core body temperature that normally ushers in the onset of longer REM episodes for night sleepers. Night workers still go through that core body temperature drop even though they are not sleeping, but body temperature dips to a lesser degree than if they were sleeping naturally at night. The core body temperature drop occurs roughly in the last third of the night, around 3 a.m. to 4:00 a.m. This lull may be a second back-up nap opportunity for night workers. However, a night worker enters a longer risk window that usually includes their drive home before a second wind of energy occurs and is bolstered by the increased sunlight of the morning. That means that night workers are often more tired in the last third of work and driving home than they are after arriving home following a full night of work. A disciplined plan is thus required to stick to a sleep schedule at that point. Otherwise wakefulness will be extended enough to cut into the night worker’s sleep opportunity. Day workers are not advised to nap except when it is built into their learning or (athletic) training schedule. Other than the "Down's" situation, napping is not harmful— but it can delay sleep onset. A large body of evidence demonstrates the effectiveness of sleep, and even naps, for learning-retention following education, training, or study sessions. Cramming before tests may work for the “information dump” of test taking, however, the brain’s temporary memory buffer is cleared out and retention is secured only with sleep. Studies have consistently demonstrated that intricate types of learning and memory require sleep-dependent “consolidation” processes, and not simply rest time. In general, learning, memory, and other cognitive associations get stamped into our brains with a “one-two punch” from NREM-specific mechanisms early in the sleep session and REM sessions later. If we truncate one part of the tandem, learning becomes compromised relative to normal sleep. It’s not hard to recognize that many of us “truncate” the REM sessions that occur in the last hours of normal sleep when we cut sleep time shorter than the 8 hours that is recommended for adults. Although they can never compensate for a poor sleep baseline, naps can help. The Sleep Architecture learning section discusses sleep-dependent processes in greater detail, including ways to conceptualize sleep before learning and sleep after learning. It turns out, both are important. Athletes can also benefit from this principle of bracketing training and performance with sleep and/or naps. Athletes utilize sleep not merely to incorporate the performance gains from training into the body, but also to recover from training and injury. Night-shift workers can utilize pre-shift naps and secondary power naps in last part of the shift. Nap opportunities should be built into the work culture. Power naps may require post-nap recovery time. Alternative shift workers and situation responders should utilize pre-shift naps prior to extended shifts or periods where extended shifts are likely (such as utility workers before storm duty). Naps help. Although naps during extended or night shifts (for example, hospital staff at night) can utilize planned nap opportunities during the circadian lull at night, pre-shift naps appear to be the most effective. Physiological sleep even during napping enacts sleep-dependent processes that are important for learning, memory, cognition & vigilance. Rest or "time of task" does not provide same benefits. Some investigators have pointed out that naps pose a risk for "sleep inertia" (residual grogginess) after a nap. This is said to create a window of risk even while it is proposed as a suggestion to reduce risk. Sleep inertia can last up to 15 minutes or more, particularly when an already sleep deprived individual enters deep slow-wave sleep. Inertia takes hold more forcefully when the body is trying to compensate for sleep deprivation or reductions in a specific stage of sleep. Waking from REM sleep also has a residual effect. Some advocates have therefore suggested that naps should be timed to either align with or stay clear of specific stages, based on the cyclical repetition of sleep stages during normal sleep. These strategies suggest napping just before or just after the likelihood of a certain stage, again, usually REM, NREM or SWS. However, performing a rough calculation of when specific stages will occur during napping— for example, REM every 90 minutes— is not reliable. Sleep stages do not operate like precise clockwork; the window of their likely onset is spread out over a small range even during the highly orchestrated sequence of normal sleep architecture at night. Sleep architecture is, however, embedded within our larger circadian rhythm patterns. The lulls in our rhythm offer the most likely period of slipping into a restorative nap session. It is also not uncommon to see warnings that advise napping to be kept to below an hour to reduce the potential for sleep inertia. Nonetheless, if work-time naps are over an hour, residual grogginess can still be overcome with a relatively short post-nap period of recovery in which the worker remains off-duty for approximately 15 minutes more after awakening. This appears to be effective for even the worst cases of inertia. 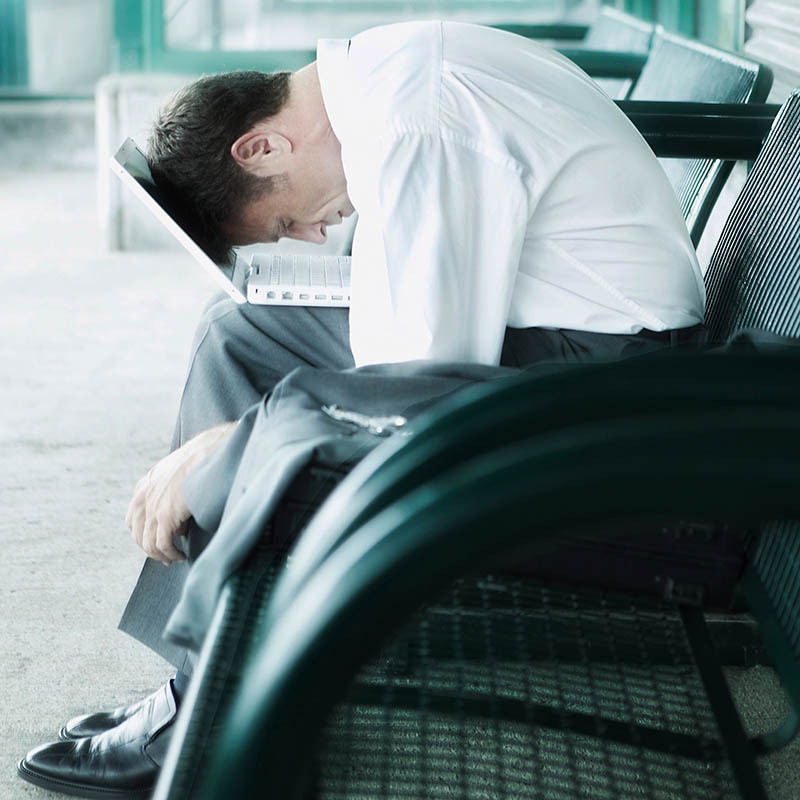 ‍In the end, the collective empirical evidence strongly suggests that the argument that naps should not be employed at work because of sleep inertia is not valid for all situations relative to the much larger risk-mitigating effects that appropriately timed naps can provide for specific populations, such as night workers. Don't be fooled by headline grabbers including those that contend that naps are potentially dangerous for your health. Like "long-sleepers", elderly individuals that engage in greater and greater periods of napping are associated with adverse medical outcomes including death. The associations, however, reveal the sleep patterns of individuals that have pre-existing medical conditions. The pre-existing conditions create changes in sleep patterns that include increased sleepiness from either the medical conditions themselves or the medical treatment. Some of those medical conditions include common sleep disorders. See the 'Short Sleep Vs Long Sleep' link for more.